Pacific walruses have come ashore on the northwest coast of Alaska in what has become an annual sign of the effects of climate change. "There appears to be several thousand animals up there," said Andrea Medeiros. She is spokeswoman for the U.S. Fish and Wildlife Service in Anchorage. Images of the walruses were captured by a photographer not affiliated with the agency near Point Lay. It is an Inupiat Eskimo village 700 miles northwest of Anchorage and 300 miles southwest of Barrow. 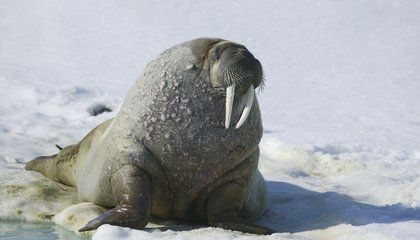 Walruses have been coming to shore on the U.S. side of the Chukchi Sea in large numbers for about eight years. They also come to shore on the Russian side. Researchers say it's likely a result of less sea ice brought on by climate warming. Walruses dive to feed on clams, sea snails and other food on the ocean bottom. But they cannot swim indefinitely. 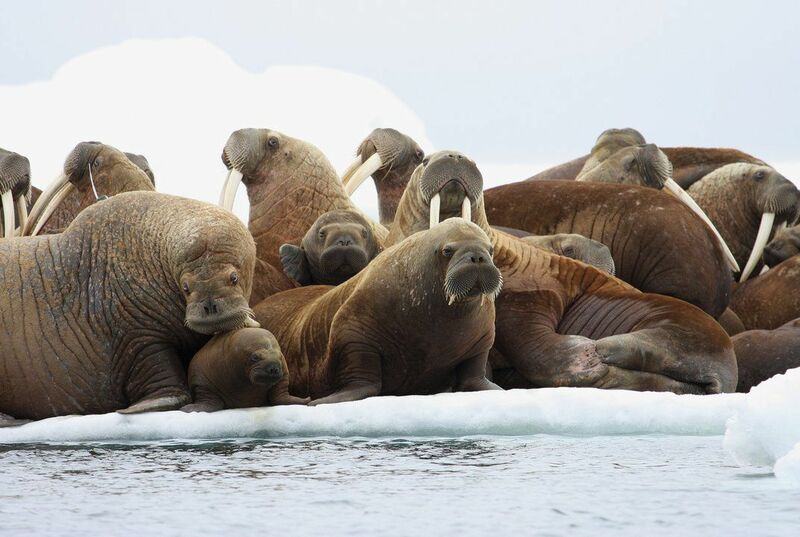 Many male walruses never leave the Bering Sea. But females, especially mothers with pups, ride the edge of the sea ice as it moves north in summer through the Bering Strait and into the Arctic Ocean. They use sea ice as a platform from which to dive for food while pups rest on the ice. In recent years, sea ice has receded north beyond shallow continental shelf waters and over water that exceeds 2 miles deep. It is beyond the diving range of an adult walrus. Walruses in large numbers were first spotted on the U.S. side of the Chukchi Sea in 2007. They returned in 2009. In 2011, scientists estimated 30,000 walruses along 1 kilometer of beach near Point Lay. Last year, an estimated 35,000 walruses were photographed 5 miles north of Point Lay. The agency and two others have issued an appeal to stay away from large gatherings of walruses that come ashore. Young animals are vulnerable to stampedes when a group gathers nearly shoulder-to-shoulder on a beach. Stampedes can be triggered by a polar bear, human or low-flying airplane. With this year's low summer sea ice, it's not surprising to see walrus on shore looking for a place to rest, Margaret Williams of the World Wildlife Fund in Anchorage said in a statement. The sharp decline of Arctic sea ice over the last decade is leading to major changes for wildlife and communities. "Such extreme events are a stark reminder of the urgent need to ratchet down the emissions that are warming our planet," Williams said. How much would you pay for the world's worst video game? Who is the world’s best on air guitar? Why do walruses leave the water and come to shore or climb on ice? Walruses leave the water to come to shore to raise their pups and climb onto floating ice to use it as a platform to dive for food of or to let young pups rest. Recently, walruses have been returning to shore more often due to the climate warming, causing a result of less sea ice. There is a huge crowd of walruses on the coast shore of Alaska. This place is crowded by animals that are huge and they live in the cold water. Now these animals have been on that coast for a few days and they haven't been moving that much on the coast of the snowy desert. I think this is bad for the walruses because today, there is not a lot of ice floes floating around for the walruses to rest on top of. This is specific evidence that global warming is taking its toll on the Earth. Ice caps are melting which leaves less space for walruses to rest on. Us as humans, the most dominant species on the planet, have to do something other than destroy nature. We also have to do our part to protect the planet. Critical Thinking Challenge: Why do walruses leave the water and come to shore or climb on ice? Answer: Walruses leave the water because they need to rest. Walruses are a very intresting aniaml. I feel bad for the walruses because they keep getting moved further away from their natural habitat. I predict that pretty soon all the ice in the north pole will be melted. Hopefully that will not happen and the ice comes back. It's kind of weird on how walruses can't swim for significant periods of time, and that's why they come back on the shore or climb on ice. Still, STOP THE DROUGHT MOTHER NATURE! They go to raise there puppies and to also for food for there pups. This was very interesting.